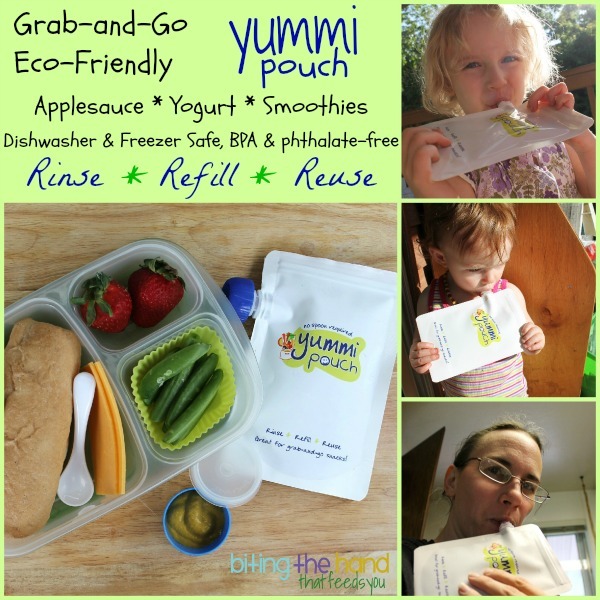 The Yummi Pouch is a great way to reduce the waste and expense of store-bought disposable "squeezy fruit" pouches. And while you can choose to buy a big tub of yogurt or applesauce to fill the pouches, you could also choose to make your own baby food, applesauce or smoothies. Save money AND be in charge of all the ingredients! 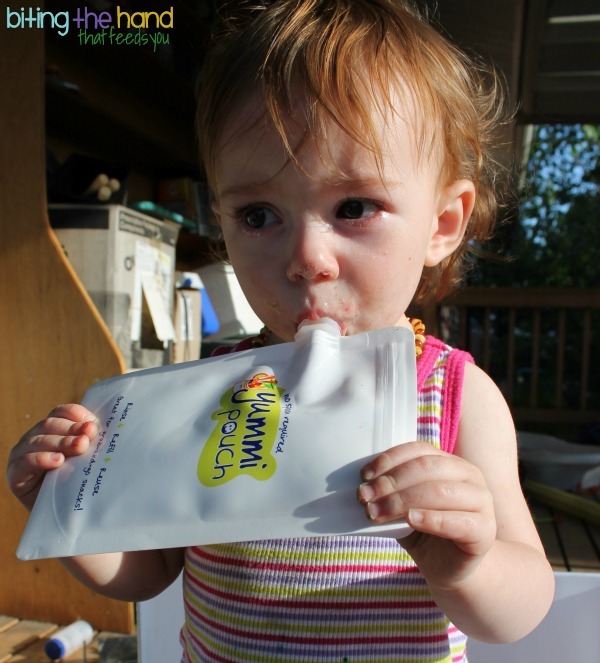 I have a hard time filling these types of pouches, since my smoothies tend to be thicker, so funnels don't work. (Check out my DIY pouch smoothies post over at MOMables!) So I got myself an Infantino Squeeze Station. It is designed to work with pouches that have the spouts sticking out of the top, since you load them into the tray and lower it down onto the frame. So it took a little creative maneuvering to get these side-spout pouches in and out. I had to kind of fold the empty pouches to get them in, and then after they were filled, I had to put the lids on so that my smoothie didn't spill out when I bent and wiggled the pouches enough to lift the tray up. Then caps back off to slide the spouts off. It took a little trial-and-error the first time, but now I'm a pro! Laziness pays off! 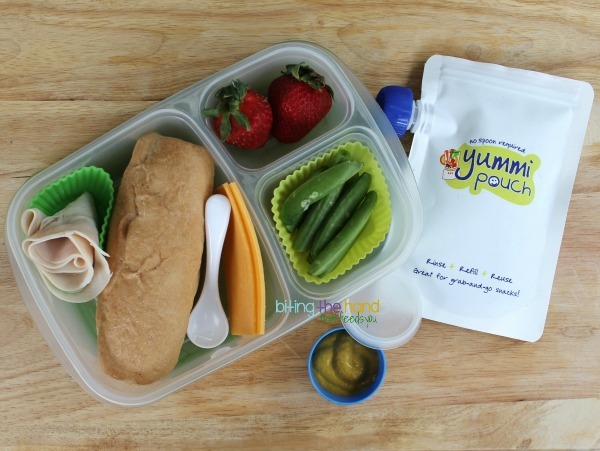 Yummi Pouch also makes a fantastic addition to a packed lunch for school or camp! If you freeze one the night before, you can even use it as an ice pack to keep the rest of the lunch cool. Very affordable! Only $14.99/6 pouches and caps - best price I've seen for these! Re-usable, but recyclable if you manage to bust it or something. They have a space where you can write notes, like date or contents, or who they're for. And they sell dishwasher-safe stickers to help jazz them up. Fun! Kid-friendly, and unlike many baby feeding items, they can "grow" with your child - start with baby mash, then move to fruit mash, yogurt, or smoothies for the older ones! Or Mamas! Says it holds 6 ounces, but it was tricky to close without making a mess. Same as any of them - lids can get easily lost, they can be annoying to clean if you don't rinse them soon after... that kind of thing. In fact, these were so popular, I have to fill them at night now. I can't pull them off the filling station faster than they can slorp them down! Mama Tip: If you have any disposable squeezy pouches, save the lids. They are compatible. And make a fun way to color-code. You know. In case you forgot which ones had plain applesauce, and which ones had a cube of frozen blueberry baby mash added in for fun. That one child refuses to eat. Oops. Hi! 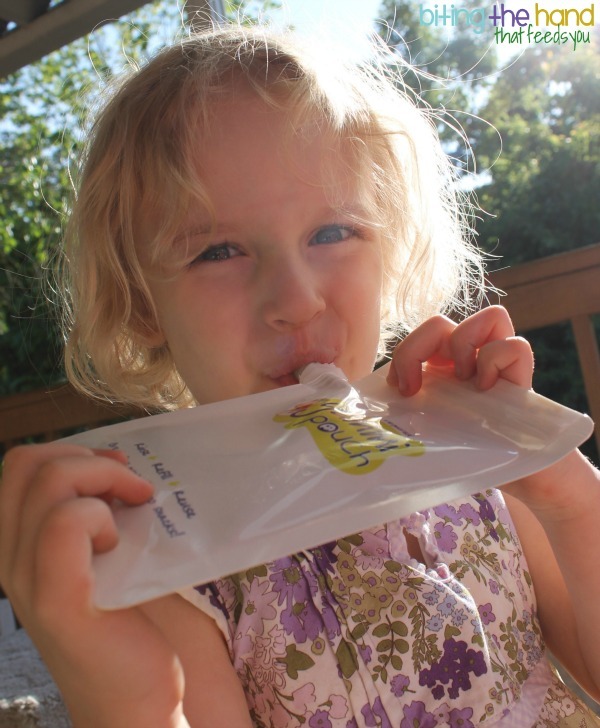 This is Katie from Yummi Pouch! I just wanted to add that the bottom gusset also expands (which you can do using a long handled cooking spoon) which allows for the full 6 ounce capacity. Expanding the bottom also allows the pouches to stand up by themselves. Thanks for the great review! 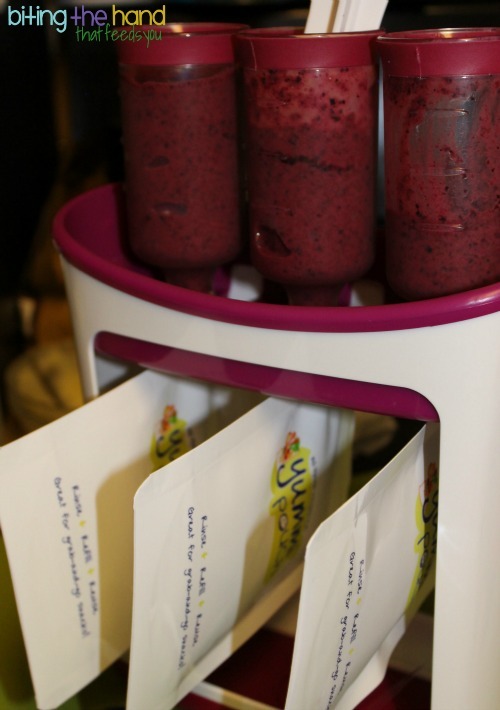 The Yummi Pouches look great and I love the Smoothie ideas :)I also like the idea of a filling station - especially with four kids!